The data transmission from the App to PC and vice versa goes to the adjacent pattern. 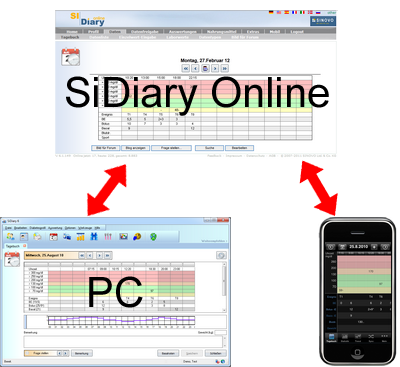 Or in other words: SiDiary Online takes here the central role. Data is aligned in both directions: the data, which is not present on one side, is merged with the data from the other side. Thus, according to a balance ("sync") on both sides the same data set is available. What seems complicated at first, you’ll appreciate soon, because you don’t need cables or additional software. On the following pages you will learn how to make the system work quick and easy for you.